The benchmark six-month forward premium payable in October edged down to 104-106 paise from 105.50-107.50 paise and the far-forward April 2019 contract declined to 247-249 paise from 249.50-251.50 paise last Friday. Rupee however, largely shrugged off high volatility in local stocks. 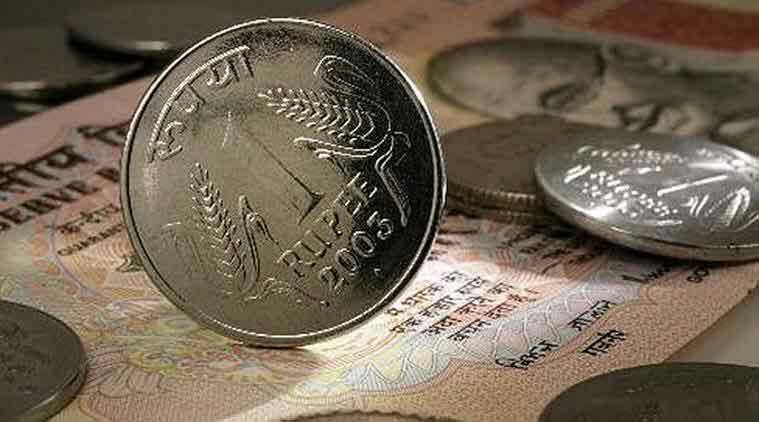 The rupee staged a recovery towards the fag-end of the session on Monday and ended with a marginal 2 paise gain at 67.99 against the US dollar even as geopolitical worries continued triggering caution among forex traders. Fag-end dollar selling by some banks and exporters predominantly supported the recovery momentum despite bullish dollar overseas. The Indian currency plunged to a fresh three-week low of 68.18 in early trade before staging a retrieval. A sharp fall in global crude prices over the last few days also came as a breather for the rupee. Besides, investor sentiments also took a hit by India’s trade deficit widening to a four-month high of USD 14.62 billion in May due to higher crude oil prices. The home currency, however, largely shrugged off high volatility in local stocks. Though, forex market sentiment was largely influenced by rapidly escalating trade tensions between the US and China. On the energy front, crude prices extended falls from late last week amid speculation that major producers are drifting towards easing production caps ahead of a meeting next week. Brent crude futures, an international benchmark, is trading up at USD 74.34 a barrel in early Asian trade. Bond markets, however, showed a mixed trend, while the 10-year benchmark bond yield settled slightly lower at 7.88 per cent as compared to 7.89 per cent. In a significant move, the Reserve Bank has eased investment norms for foreign portfolio investors (FPIs) in debt, especially into individual large corporates, that can help attract more overseas flows and thereby help arrest the recent fall in the rupee on one hand and also lift the recent fall in demand for corporate bonds. India’s foreign exchange reserves increased by USD 879.5 million to USD 413.109 billion in the week to June 8, helped by rise in foreign currency assets, the Reserve Bank data showed on Monday. After selling off drastically over the weekend, the rupee resumed substantially weak at 68.16 at the interbank foreign exchange (forex) market. Extending downward pressure, the local unit lost further ground to test a low of 68.18 briefly in mid-morning deals. But, it later reverted the initial negative momentum and managed pull back to hit a fresh intra-day high of 67.94 towards the tail-end trade before ending at 67.99, showing a small gain of 2 paise against the US dollar. The RBI, meanwhile, fixed the reference rate for the dollar at 68.0248 and for the euro at 78.8543. The dollar index, which measures the greenback’s value against the basket of six major currencies, was down at 94.41 after scaling a high of 95.15 earlier. The greenback traded marginally lower against its major trading rivals after a decision by the United States on Friday to enact tariffs on USD 50 billion in Chinese goods was the latest salvo in a widening trade dispute between the world’s biggest economies, keeping broader markets on edge. In the cross currency trade, the rupee also hardened against the pound sterling to end at 90.09 per pound from 90.30 last weekend. The home unit, however, fell back against the euro to finish at 78.96 from 78.82 and also drifted further against the Japanese yen to settle at 61.55 per 100 yens as compared to 61.45 earlier. Elsewhere, the common currency euro is trading lower against the greenback, impacted by Germany’s political crisis and growing concerns about the refugee crisis in Europe. In forward market on Monday, premium for dollar continued to rule weak due to consistent receiving from exporter.